Destin Florida Area and Walton County flower shops and florists. 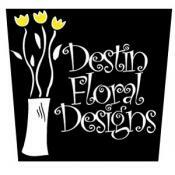 Destin florists and flower shops offer beautiful arrangements for everyday or that special occasion, ceremony or holiday, from wedding flower arrangements or a dozen roses to delight someone! Flower shops and florists in the Destin area, Fort Walton Beach and Walton County, including Sandestin & Santa Rosa Beach florists, offer fresh floral arrangements and dried floral decorations. Beautiful edible fruit arrangements also available.